The premise of this book is intriguing: Claire's husband has been keeping secrets from her. Secrets that threaten their family and specifically their little girl, Bea. With their child's life at stake, Claire must choose between trusting her husband or attempting to get at the truth by herself, which might ultimately mean betraying her husband. A solid premise, with plenty of scope for an exploration of the dark themes of blackmail, lies and loyalty. Unfortunately (at least for this reader) the execution of the story in a style more commonly seen in chick-lit, makes for a somewhat tame and predictable tale of marital bliss briefly but inadequately threatened by not-quite-credible forces. 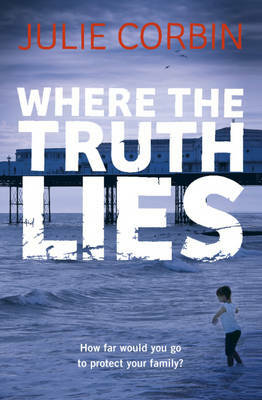 This is Corbin's second novel, her first having been described by Cosmopolitan as 'a gripping debut'. There's no doubt that Corbin knows her readership and writes to them, very well. Her heroine is just gutsy enough without being a threat to the perceived norms of a lovely wife and mother, able to gain confidence in times of crisis by choosing the right pair of platform shoes from her wardrobe. Claire's home life is beautifully described in the opening chapter, packed with perfect friends, handsome husband and children, a terrific house. For the tension in the story to work, this idyll must feel threatened, preferably on an escalating scale, as the story unfolds. The promise of a happy ending, however, felt inherent from the start, almost as if Corbin was holding the story at arm's length or sealing it somehow in clear plastic, like a new sofa. Claire's dilemma wasn't allowed to get under my skin as a reader, which is what I want from a crime novel. The use of the present tense was perhaps partly to blame for the sense of being one step removed from the heart of the story. It's an unusual choice for any author and here it seems doubly strange given how often Corbin allows her heroine to wander into memories of the past. When, for instance, Claire is first in touch with Mac, the policeman tasked with her family's protection, we expect her anxiety for Bea to drive the narrative forward. Instead, she diverts us up the blind alley of her past sexual encounter with Mac. Even when she's angry with her husband for allowing the threat to hang over their family, she cannot resist peppering the present tense telling of the scene with exposition from another, happier time: "I'm not enjoying this," she observes to herself. "We rarely fall out. I'm not trying to take the upper hand." But why shouldn't she take the upper hand? Given her husband's failure to do so with the people threatening his family? The past tense might have been a better choice for this story, simply because of the expectation that the present tense imposes. The story moves at a good pace in terms of its plot, but the immediacy of the present tense is lacking. Crime is a broad genre, with plenty to satisfy widely differing tastes. Many readers will find this story hugely satisfying, especially those who like their crime a shade lighter than dark. Sarah blogs at Crawl Space.